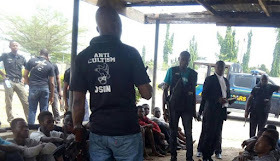 The suspects are alleged associates of the most wanted suspected kingpin in the cult gang called Jepro who allegedly started his reign of terror in Somolu/Bariga areas of the state. He is alleged to be into armed robbery, kidnapping, cultism, etc and his alleged exploits earned him not just the fearful nickname, Jepro, but also significant wealth to show for it. 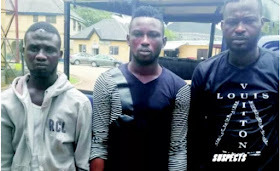 Sources said Jepro, who has been on the wanted list of the police in Lagos for long, escaped several times after committing crime and efforts made to arrest him always ended in noughts. He narrated how he was initiated: “I am from Ogun State and single. I live with my mother at Elanke Number 4, Ibadan Street, Oworonshoki. I have three friends from Osun State. One day, we went for their father’s burial. That was where the battle was staged. It was night before I knew they had initiated me into Aiye cult. They were four in number, so they put me in their midst. After that, I left them there and came back to Lagos. That was in 2015. SUSPECT No 3: “My name is Kunle Sholeye. I am 38 years old. I attended primary and secondary schools. I am married with a child. I have never killed anybody in my life. I didn’t benefit anything from belonging to Eiye Confraternity, and I pity myself for joining. I joined because Femi Jepro called me that there was a party and when I got there, they initiated me. As I joined, they made me a member of Road Transport Workers Union at Jibowu”.